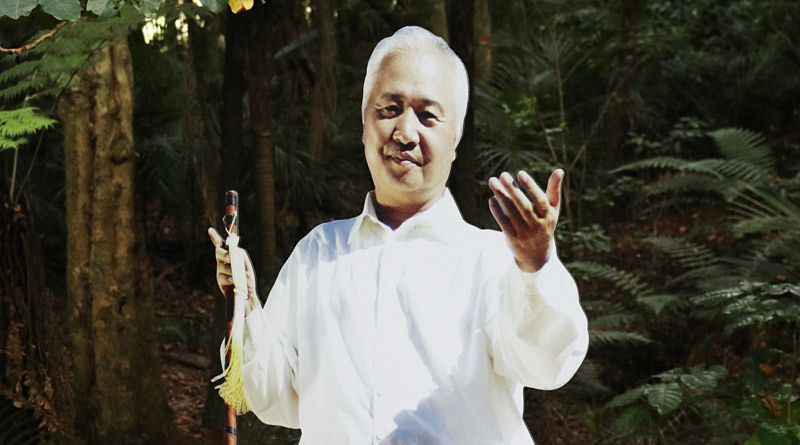 Two years ago a mysterious Korean spiritual leader turned up in a small northern New Zealand town, started buying up millions of dollars’ worth of property and claimed to be building a global headquarters for an organisation of 100 million followers. So why did he pick Kerikeri, a town of just 6000 people, and where have his plans for an Earth Village taken him so far? I decided to find out. In the bush-clad hills west of Kerikeri a ghostly figure waits. He is dressed all in white with hair to match, almost glowing amid the damp green gloom of the forest. One hand holds a walking staff, the other is extended in welcome. 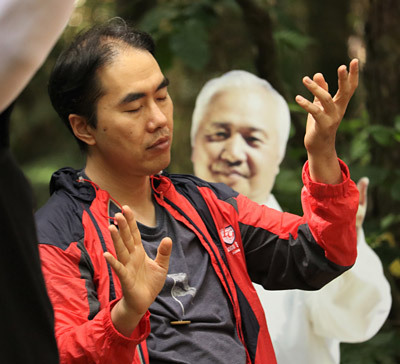 On closer inspection it is no ghost but a life-size cut-out of Ilchi Lee, a South Korean spiritual leader and businessman who has appeared on the cover of Rolling Stone and made a fortune from his own brand of yoga, books, and brain and body education techniques. But what’s he doing — several of him in fact — in the Bay of Islands bush? In 2016 Seung Heun Lee, known to his followers as Ilchi Lee, started buying up property in the Bay of Islands. His shopping spree included four high-end homes in Kerikeri, 156 hectares of pine forest and bush on Pungaere Rd on the edge of Puketi Forest, a 25 hectare waterfront property beside Whangaroa Harbour and Haruru Falls Panorama Resort, a hotel and campground near Paihia. Sign beside the Earth Village bushwalk near Kerikeri. The 68-year-old made no secret of his plans — he even took out full-page ads in Northland newspapers — but his interest in Kerikeri was puzzling. 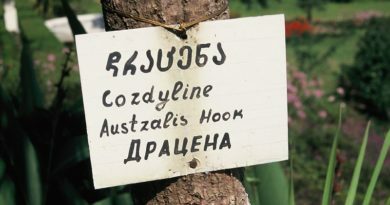 Locals were alarmed by his plans to build a global hub for his Earth Citizens Organisation (ECO) and recruit 100 million members, while a YouTube video in which Lee complained about bureaucracy hindering development of his Earth Village had some townsfolk fearing he would ride rough-shod over Far North planning rules. It was unclear how a Korean citizen had been able to buy so much land without Overseas Investment Office permission (it later emerged he had been granted residency so didn’t need the office’s say-so) and any Google search will reveal the Dahn Yoga movement Lee founded, but no longer owns, has attracted lawsuits and controversy in the US. Some of his followers’ pushy attempts at recruitment didn’t exactly win over wary Kerikeri residents either. More than two years later, Lee’s plans for an Earth Village and ECO training headquarters on Pungaere Rd are progressing, but slowly. It seems even a spiritual leader’s millions are no match for council planning regulations. Lee speaks next to no English but his spokeswoman, Yewon Hwang, offers to take me on a tour of the site. Hwang is a doctor from Korea who was studying to be an eye surgeon when she realised it wasn’t her calling. She worked at an ECO centre in Arizona for 10 years before coming to New Zealand, where she is Lee’s interpreter and a director of his tourism business, Meditation Tours. She is also one of two trustees, along with Kerikeri’s Lily George, of the Earth Citizen Organisation NZ Charitable Trust. 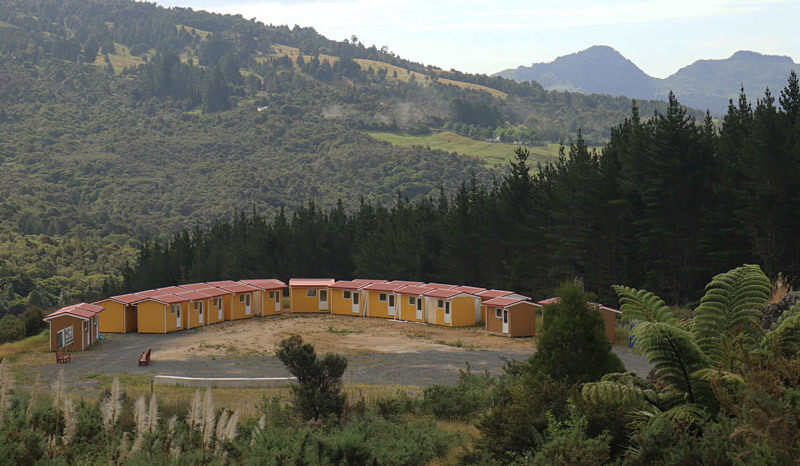 Lee had planned to put 360 two-bed cabins on the Pungaere Rd site so it came as a surprise to him that the District Plan limits the number of people who can stay on the property to just 156. He has so far put in metal roads, had pine trees felled and about 30 cabins built. The need for an earthworks consent was apparently another surprise so the cabins are lined up on a temporary site until the paperwork is sorted out. ‘‘In Korea building is faster and fewer consents are required, that’s why we had the cabins built first. At first we were really ignorant, thinking it would take three years to finish everything,’’ Hwang says. While the slow pace of New Zealand officialdom is frustrating, she also realises this country’s strict consenting rules are part of the reason it hasn’t yet been turned into a concrete jungle. Hwang also accepts the reduced scale of the Earth Village. She hopes the Earth Village will open in 2020. The idea is that young people from around the world will stay for up to a year learning about environmental sustainability and leadership, then take the lessons back to their home countries. One part of the Earth Village which has been completed, however, is a walk through the native bush which covers about a fifth of the property. It’s a pretty bit of bush — on the day I visited it was ringing with the song of riroriro (grey warblers) and pipiwharauroa (shining cuckoos) — but, to New Zealand eyes, not exceptional. To Korean eyes, however, it is something primeval, unspoiled and profoundly beautiful. 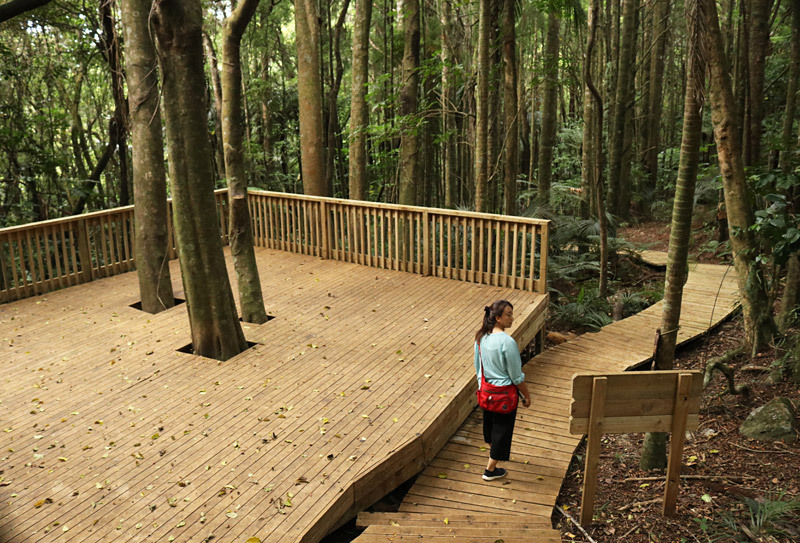 A boardwalk punctuated with wooden staircases and meditation platforms has been built along several hundred metres of the trail. Regular signs along The Way of New Life carry chapter headings from one of Lee’s books, such as ‘Between Heaven and Earth’ and ‘A Dream that Makes Your Heart Pound’. 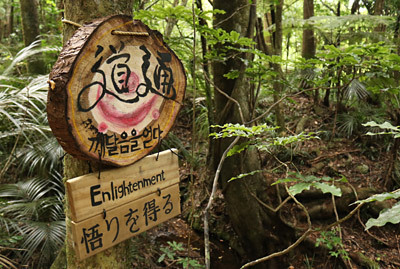 Meditation Tours director Yewon Hwang passes a meditation platforms on ‘The Way of New Life’. The walk culminates in a wooden staircase of 120 steps, a reference to Lee’s belief the human body is capable of living for 120 years. ‘‘The stairway is designed to make you reflect on your life so far and the years you have left to lead,’’ Hwang says. 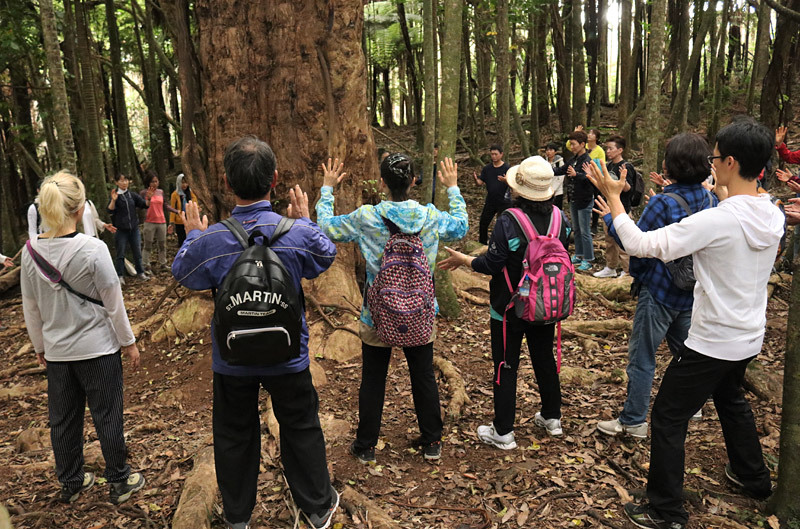 The bush walk is used by Meditation Tour groups to practice qi gong (a system of movement, breathing and meditation similar to tai chi) and meditation. Hwang says forest meditation is popular in Korea but it usually involves lying on a building roof and imagining you are in the bush when all you can hear is the honking of traffic from the streets below. While the Earth Village might be a not-for-profit venture, Lee is definitely also here to do business. Last year Meditation Tours brought 52 groups to Northland, each with 40-50 people. That number could quadruple to 10,000 a year by 2025, Hwang says. About 70 per cent of the company’s customers are from Korea with 20 per cent from Japan and 10 per cent from the US. 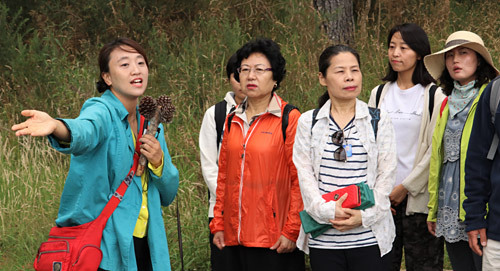 Meditation Tours director Yewon Hwang shows a group the Earth Village site. 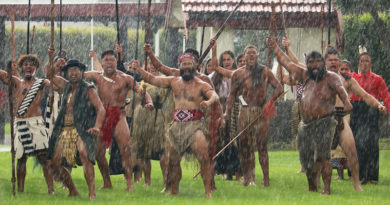 Most stay at the renamed Haruru Falls Retreat and, apart from a half day in the bush at the Earth Village site, they are taken to see the giant kauri tree Tāne Mahuta, the Treaty Grounds and Paihia. Some also try kayak meditation on the Waitangi River or the Haruru Falls-Waitangi walkway. Other ventures include an ECO centre offering yoga classes in central Kerikeri and plans to offer English language courses for overseas students. 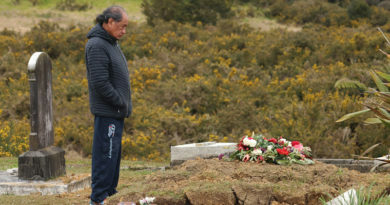 Lee is also keen to grow medicinal plants and supports a marae-based youth development programme, part of youth suicide prevention strategy run by the Ngātiwai tribal authority. One of the biggest ventures planned by Meditation Tours, however, has been shelved. The company bought Marty’s Café and Golf Driving Range, on State Highway 10 north of Waipapa, with the intention of building a martial arts school for Korean gap-year students. Some neighbours objected because of the expected increase in traffic down their right-of-way, which meant the plan would have had to go through a full resource consent hearing. Rather than go against the neighbours Lee decided to rethink the school’s location. ‘‘The martial arts school will happen one day, but maybe on a different site,’’ Hwang says. In early 2017 the Earth Citizens Organisation held a gathering in Kerikeri with a peace festival on the Domain and a series of seminars in the Turner Centre. More than 600 people attended, many travelling all the way from Korea. The festival included the surreal sight of hundreds of devotees poking their navels with a belly button wand, a device Lee says improves circulation and gut health, while his appearances were accompanied by the type of adulation usually reserved for rock stars or royalty — plus minders who made sure no one touched him. Such things fuelled talk that Kerikeri was being invaded by a cult. 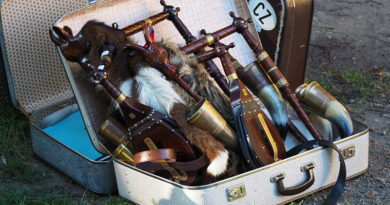 ECO trustee Lily George, however, puts the cult label down to cultural misunderstanding. ‘‘This is culture, not a cult. Their deference to him is misunderstood. He’s very elevated — people weren’t allowed to touch him at the Kerikeri event — but from what I’ve seen since then, he’s learnt that Kiwis like to shake hands and kiss cheeks. Now he even gives hugs and hongis,’’ George says. Hwang says the speculation prompted her to look up the definition of a cult, learning that all cults involve some form of coercion. She jokes that if it is a cult it’s not a very good one because she can’t even coerce people to keep paying their membership fees for yoga classes at Kerikeri’s ECO centre. So why did Lee pick New Zealand, specifically Northland, as the base of his global movement? Hwang says Lee first came to New Zealand in 2013, visiting Auckland, Rotorua, Queenstown and various other places. 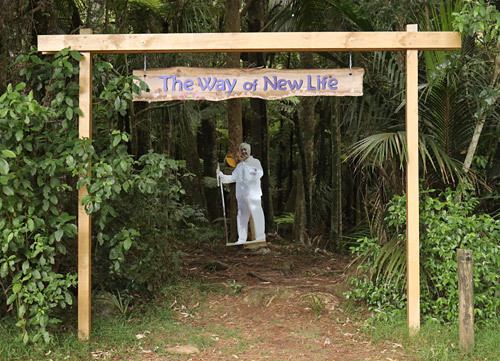 A cut-out of Ilchi Lee welcomes visitors to ‘The Way of New Life’. ‘‘So he flew to Kerikeri and from the moment he landed felt the land was very warm and welcoming. He went to Rainbow Falls and loved the energy of the place. As he walked around he felt connected, the land was calling him,’’ Hwang says. ECO already has centres in the US, Asia and Europe, but Lee was looking to build his global headquarters somewhere else. He had earlier bought a vast swathe of land in Canada but was unpleasantly surprised when he returned in the depths of winter. He returned several times to New Zealand before deciding to make it his home and find a site for his Earth Village. The next time I drop in to see the Pungaere Rd property a Korean tour group is visiting. They number just over 30 and range in age from late 20s to mid-60s. All look lithe and fit, and not one breaks a sweat or puffs during the bush walk. The other thing that sets them apart from a typical western tour group is how attentive they are, with lots of clapping and oohs and aahs at the right moments in Hwang’s commentary. A visitor practises qi gong next to a cut-out of Ilchi Lee. Every now and then they stop for a qi gong session or meditation. They’re especially impressed, moved even, by a gnarled and ancient puriri tree. They touch it reverently and almost have to be dragged away. Chae Ryeon Kim, 30, is one of the younger members of the group. 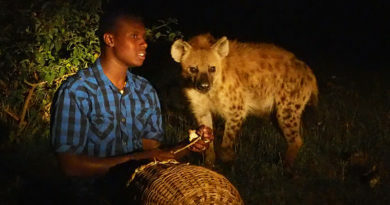 The YouTube content producer says she chose the tour after reading Lee’s book I’ve Decided to Live 120 Years, in which he describes his plans for an Earth Village near Kerikeri. Like the others in her group Kim is awed by the trees around her — and she hasn’t even seen Tāne Mahuta yet.